Madison Coupon Connection: LivingSocial Vistaprint Deal! $10 for $50 worth! Today only, you can get $50 worth of items at Vistaprint.com for just $10! 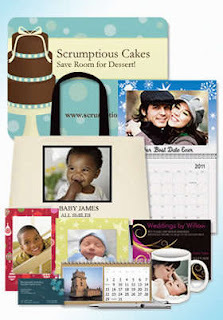 At Vistaprint, you can order personalized photo books, business cards, mugs, pens, invitations, etc. There are so many great options! Think Valentines Day gifts! Go to "LivingSocial" and sign in or create an account. If you're new to LivingSocial, you can click on the "my account" tab and then "deal bucks" to see a $5 credit added to your account, just for joining! Click on "more deals" and choose "Atlanta". Click on "Buy now" to complete your order! The day after the deal has ended (this deal ends today), you'll get an e-mail from LivingSocial with your deal voucher attached. You can also retrieve your voucher from your LivingSocial account.